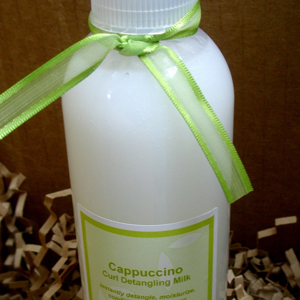 Use as a daily or weekly leave-in to help detangle, moisturize, and soften your lovely curls. Distilled Water, Organic Aloe Vera Juice, Vegetable Glycerin, Organic Soybean Oil, Sweet Almond Oil, BTMS (a mild conditioning emulsifier), Guar Silk, a paraben-free preservative, and fragrance. Apply a small amount throughout wet or dry hair for healthy conditioning and moisture.